Translucent Squeezable Custom Water Bottle - 28 oz. This squeezable custom water bottle holds 28 oz. of your cool drink and is made of durable, impact-resistant, BPA-free plastic that does not retain odor or taste. Triple Insulated Stainless Steel Custom Water Bottle w/ Carabiner - 26 oz. Keep a cold drink with you any where you go with this 26 oz. Triple Insulated Stainless Steel Custom Water Bottle with Carabiner! Clip it to your bag, backpack, or luggage to ensure you stay hydrated. Stainless Vacuum Custom Bottle – 25 oz. This 25 oz. Stainless Vacuum Custom Bottle is ideal for keeping your beverage the optimal temperature whether its a bottle of wine or keeping water on the table perfectly chilled. The threaded lid keeps it closed so you co carry in your bag to the beach or picnic and large enough to keep you hydrated. Full Color Stainless Vacuum Custom Bottle – 25 oz. Whether you bring wine, water or another beverage of choice, this 25 oz. Full Color Stainless Vacuum Custom Bottle is large enough for you to share wherever you may be going. It fits an entire bottle of wine, while also keeping it the perfect drinking temperature! Your full-color imprint is sure to stand out! Biodegradable Translucent Logo Water Bottle - 20 oz. BPA-Free and made of 100% biodegradable plastic, this logo water bottle is both healthy for you and the environment. Stainless Steel Double Wall Custom Water Bottle w/ Wood Lid - 21 oz. This stylish Stainless Steel Double Wall Custom Water Bottle w/ Wood Lid is perfect for keeping beverages hot or cold for hours! Available in 6 unique colors to make your branding stand out. Bluetooth Speaker Custom Water Bottle - 13 oz. Stay hydrated and listen to your favorite tunes at the same time. This Bluetooth Speaker Custom Water Bottle is perfect for a day at the beach, a gym workout, and more! Shatter Proof Tritan Custom Water Bottle w/ Carabiner - 28 oz. Keep hydrated on-the-go with this Shatter Proof Tritan Custom Water Bottle w/ Carabiner! Simply clip it to your backpack or bag and go. Jumbo Foldable Promotional Water Bottle - 28 oz. Avoid all that watsed space when your water bottle is empty. Carry this foldable, promotional bottle instead! Stainless Steel Deluxe Holographic Custom Bottle - 17 oz. Beautifully eye-catching, these trendy Stainless Steel Deluxe Holographic Custom Bottle shifts between two colors as light hits the coating from various angles. The double vacuum insulation keeps liquids cold for up to 24 hours, and warm for 12 hours! Marble Copper Vacuum Custom Water Bottles - 17 oz. The sophisticated marble finish of these 17 oz. Copper Vacuum Custom Water Bottles is a great upsell to the regular colored water bottles. The inner wall is plated with copper and will keep your drink hot for 12 hours and cold for 48 hours. CamelBak Eddy Custom Water Bottle - 25 oz. Durable and perfect for your next adventure! This 25 oz. CamelBak Eddy Custom Water Bottle is made of durable tritan material that is shatter, stain, and odor resistant. The spout features a straw, letting your recipients drink without tipping the bottle! Slim Double Wall Matte Custom Water Bottle - 24 oz. This Slim Double Wall Matte Custom Water Bottle is a great giveaway for any event and can be used for hot and colder beverages. Speckled Stainless Steel Vacuum Custom Water Bottles - 16 oz. The classy, speckled design of these Stainless Steel Vacuum Custom Water Bottles offer a unique look! Keeps drinks cold up to 24 hours or hot up to 12 hours! Full Color Stash Promotional Tumbler - 22 oz. This Full Color Stash Promotional Tumbler features a removable bottom to store small snacks, vitamins, and more. The large imprint area is a blank canvas ready to be designed to fit your branding! Custom Water Bottle - 24 oz. Classic custom water bottle at budegt-friendly price! Laser Engraved Stainless Vacuum Custom Bottle – 25 oz. Add a touch of class to your next promotion with this 25 oz. Laser Engraved Stainless Vacuum Custom Bottle. The vacuum insulation keeps beverages at the perfect temperature for hours and large enough to keep you hydrated. 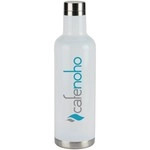 Glass Promotional Water Bottle - 20 oz. This Glass Promotional Water Bottle features dual openings for easy cleaning and adding ice cubes! It's wrapped with a soft grip sleeve that is also anti-slip. Plastic Promotional Sports Bike Bottle - 21 oz. This promotional sports bike bottle provides a budget friendly give-away as well as a handy water bottle for thirsty bikers. Stay hydrated all summer long with this Freezable Ice Stick Custom Water Bottle! The ice stick will help keep your beverage of choice cool for hours. Slazenger Golf Custom Water Bottle Pouch - 24 oz. Custom water bottle and matching golf pouch with tee slots. HydroPouch! Collapsible Custom Water Bottle - Baseball - 24 oz. Get a Home Run advertising with a custom water bottle that is both flexible and foldable! These BPA free custom water bottles are made from Tritan material and do not retain odors or tastes. HydroPouch! Collapsible Custom Water Bottle - Basketball - 24 oz. Bounce your way in summer with a custom water bottle that is both flexible, foldable and fun for all! Wide Mouth Stainless Steel Promotional Sports Bottle - 26 oz. Stainless steel promotional sports bottle with with colorful rubber accent. Biodegradable Imprinted Sport Bottle - 28 oz. Cool Gear Hydrator Custom Water Bottle - 24 oz. This 24 oz. Cool Gear Hydrator Custom Water Bottle makes the perfect gift or giveaway for any occasion. Colorful Tritan Custom Water Bottle - 24 oz. Stay hydrated with this trendy Colorful Tritan Custom Water Bottle! Made of durable tritan plastic, this bottle comes in 7 fashionable transparent colors that are sure to make your logo stand out. BPA Free Filtered Logo Sports Bottle - 26 oz. Logo sports bottle with patented filtration and freezer stick system. Flip & Sip BPA-Free Imprinted Sports Bottle - 21 oz. Imprinted sports bottle made of BPA-Free PETE plastic with easy to use flip and sip cap. Contour Translucent Custom Water Bottle w/ Push Pull Lid - 24 oz. The contour shape of this translucent custom water bottle makes it easy to grip even when your hands may be wet! Choose from a wide variety of bottle & cap colors! Iridescent Copper Vacuum Custom Bottle - 17 oz. Make your next promotion stand out with this trendy stainless steel Iridescent Copper Vacuum Custom Bottle. This bottle is sure to become your clients go- to drinkware. Clean Cut Aluminum Custom Water Bottle - 25 oz. This lightweight aluminum custom water bottle is a cut above the rest with 2-tone, single wall design. Tritan Reusable Custom Water Bottles - 24 oz. These 24 oz. custom water bottles may look like a disposable water bottle, but they actually can be reused again and again. Soft Silicone Folding Custom Water Bottle - 16 oz. Add some color to your next outdoor promotion with this distinctive custom water bottle. Tritan Custom Water Bottles w/ Rubber Hole Cap - 20 oz. Everyone will want these custom water bottles made of BPA-free Tritan plastic that can hang on duffel bags or backpacks. 6-Sided Tritan Custom Water Bottle - 40 oz. Be forever refreshed as long as you carry this great 6-sided Tritan custom water bottle around! The unique design is as appealing as it is convenient. 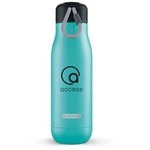 Collapsible Promotional Water Bottle - 28 oz. Make a difference in the environment with this eco-friendly collapsible promotional water bottle. Accordion Collapsible Promotional Water Bottle - 28 oz. A accordion style collapsible promotional water bottle makes the perfect gift or giveaway for any occasion. Color Changing Promotional Sports Bottle - 24 oz. 24 oz. promotional sports bottle changes color when you add refrigerated water. Geometric BPA Free Custom Water Bottles - 28 oz. These 28 oz. custom water bottles feature a bold geometric design that will draw immediate attention to your brand. Lite Grip Imprinted Sports Bottle - 25 oz. An easy to grip imprinted sports bottle made with BPA-Free impact resistant PETE plastic.